Everyone’s favorite maid of mass destruction is back, so baddies beware! 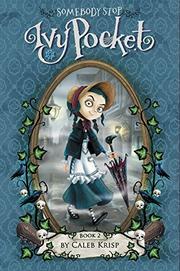 Like Oliver Twist but with decidedly more delusions of grandeur, former maid Ivy Pocket (last seen in Anyone but Ivy Pocket, 2015) finds herself newly adopted by a pair of nefarious coffin makers. Not that Ivy, impervious to hints and clues, is capable of noticing their dire deeds, even though she’s surrounded by villains on every side (a malicious ghost, a familiar face in disguise, and a vengeful sister). Ivy has two remarkable possessions; a magical Clock Diamond that allows wearers to travel between dimensions and a trademark hubris that lends her a strange sort of invincibility. When she discovers that an old friend is trapped in another world, it’s Ivy’s headstrong bravery that is both her downfall and her salvation. Ivy’s self-delusions have become more comforting than annoying in this second adventure. Though she is drugged, hunted, and trapped in a madhouse, nothing leaves so much as a mark on her chipper worldview. Krisp’s writing also proves to be as hilarious as ever (“I…began thrashing the carpet as if it were a wayward son who had just lost the family estate, and quite possibly his pants, in a rather thrilling game of checkers”); his and Cantini’s 19th-century London appears to be largely white. After this book, readers will demand to know more about Ivy’s background, even as they clamor for her next outing.